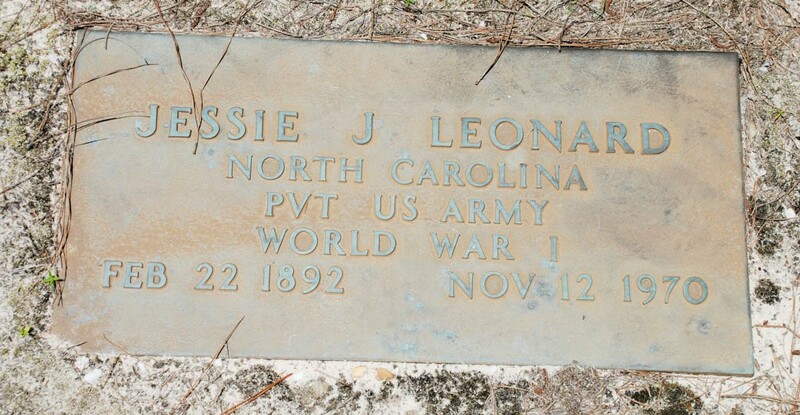 WWI Profile: Jesse James Leonard 1892-1970 | Friends of Fort Caswell Rifle Range, Inc.
Jesse James Leonard was born and raised in Brunswick County, NC. A partial family tree is in FamilySearch. His 1917 Draft Registration Card shows he was married, farming, and living in Shallotte. He was married to Mary Lillian Grissett on December 6, 1916. Jesse was ordered to report to duty on October 4, 1917 [Source: ancestry.com]. Private Leonard was initially assigned to Company M, 120th Infantry, 30th “Old Hickory” Division, then moved to Company D. He eventually began training at Camp Sevier, SC, as reported in previous posts. As mentioned in a previous post, Private Leonard, along with Private Pigott, was scheduled to depart for France on May 17, 1918, but did not board the USS Miltiades with their Companies. Instead, both boarded Ascanius on June 5, with many other soldiers of the 30th Division who were detached from their units, for reasons unknown. Multiple posts have included the horrific details of the Hindenburg Line and the many who were wounded or died during the assault. Private Leonard was not wounded at that time, but in the push afterward. Refer to the WWI Profile post of 1st Sgt Van Grissett Mintz for more details of these operations from the 119th Infantry documents. The 120th Infantry followed similar orders. On October the 1st, when the Division was withdrawn from the [Hindenburg] line, this Regiment moved by marching to the Tincourt Area. On October the 2nd the movement continued, the Regiment marching to Belloy, west of Peronne. This area had been fought over for four years, changing hands time and again; as a result, it was a perfect example of destruction–of many villages nothing remained, no one would have known a house had ever existed but for the signboard marking the site. It was hard to realize that this, the Somme Country, had at one time been the most productive part of France. On October the 5th the Regiment returned to the Tincourt Area, and on October the 6th the movement continued to Villeret. Private Leonard’s NC Service Card shows he was wounded on October 10, but it was crossed out and changed to October 9. Mistakes were made during the operations that followed. On the afternoon of October 8, the 120th Infantry moved to Joncourt, but left the 1st and 2nd Battalions [Companies A-H, which includes Pvt Leonard’s Company D] as reserve battalions for the 117th and 118th Infantries. The 117th and 118th Infantries were attacking near Montbrehain. Companies A and B of the 120th Infantry were being used in the front line near Premont, while Pvt Leonard’s Company D was used in the taking and mopping up of Brancourt. At 2:00 am on October 9, the 120th was ordered to join the 118th to hold the general line Premont-Brancourt in an attack to be launched at 5:30 am. Three and a half hours is a very short time in which to prepare orders and distribute them to the troops. The 120th had to regain Companies A-H, which were still under the 118th’s command. The orders were quickly prepared and distributed to those Companies and support units present with the 120th. They were surprised to learn that the 118th Infantry had notified their own units but never notified the Companies of the 120th Infantry to return to their own Regiment. Companies A-H were still operating as if they were under the previous orders and command of the 118th. Companies A-H were essentially abandoned and forgotten as they moved through the area locating and “mopping up” isolated enemy troops. In spite of the lack of assistance given by [the 118th Infantry] the battalions were located, and the battalion commanders by almost superhuman effort collected their companies and followed the 118th Infantry–the 2nd Battalion on the right, the 1st Battalion on the left, and the 3rd Battalion in support. In this and in future engagements the 3rd Battalion, in support, was engaged shortly after the attacking battalions went into action. This Regiment was to pass through the 118th Infantry, when it reached its objective, and should have done so about 10:00 A. M.
The 118th was held up, however, by machine gun fire from the right, and this Regiment did not pass through and take its objective until 4:00 P. M. The villages of Becquigny and La Haie Meneresse and the Bois De Busigny were taken, and a platoon from the 3rd Battalion was diverted to assist in taking the town of Bohain, where the unit on the right was held up. It’s not known whether these mistakes played a role in the wounding of Pvt Leonard, but he was wounded during these operations of October 9. On the morning of the 10th the advance continued, and after severe fighting the town of Vaux Andigny was taken. This position was enfiladed from the Bellvue Farm on the right, and, as the right of the Regiment was nearly 3,000 yards in the air, the troops were withdrawn a few hundred yards to the western edge of Vaux Andigny. On the morning of the 11th the 118th Infantry, who had come up too late to take care of the right of this Regiment, attacked through this Regiment, but was unable to advance more than 200 yards. Between October 7th and October 12th, 1918, the following 120th Infantry casualties were reported. There are no details on Pvt Leonard’s wound. It was described as “slight” but the recovery period was unknown. He may have returned later, but given that the war ended soon after and little action was seen by the 120th after October 20, most of the fighting would likely have been completed by the time he was fit for duty. Pvt Leonard returned to the United States with his Company on April 11, 1919. He was honorably discharged on April 17th and returned to Shallotte and his wife. Jesse James Leonard and his wife lost at least two small children, as shown in findagrave, but also had at least two other children. Tragically, his son, Mahlon Mallory Leonard, died while serving in Germany during World War II. The December 20, 1944 issue of the State Port Pilot reported him wounded. This was followed by his death on June 8, 1945, in a auto-truck accident in Germany. His funeral was reported in the September 14, 1948 issue of the State Port Pilot. Killed in an auto-truck accident in Luxomburg, Germany, on June 8, 1945, the body of Mahlon M. Leonard, well known 24-year old Shallotte Village Point man, was brought home last week and interred in the Gurganus cemetery near Shallotte, Sunday. Funeral services were held at the graveside with Rev. Austin J. Wheeler and Rev. B.W. English, both of Wilmington. Private Leonard is survived by his widow, Mrs. Laura A. Leonard, and a small son, Malory B. Leonard; his father and mother, Mr. and Mrs. Jesse J. Leonard, and a sister, Miss Connie L. Leonard. Jesse James Leonard passed away in 1970 at age 78. He was laid to rest in Gurganus Cemetery with his wife, and the three children who preceded him in death. Military honors are shown.